Ankle boots have flooded the high-street this season and the choice is huge (some are wide at the ankle, some are narrow (sock boots), some are pointy and some squared toe etc…) but, despite the varied choice available, I know that a lot of women struggle to know how and what to wear them with. First there’s the issue of what to wear them with – do they look good with dresses, or jeans, or both? And are some styles better suited to dresses than pants?? Then there’s the question of how tall to go – are short booties better than tall? There’s the decision on whether to tuck your jeans in or not – the boot ankle is either too narrow to tuck your jeans in which means they bunch awkwardly on top of the boot, or they’re too wide to wear your jeans over the top of them. And then there’s the question of which style of jeans or pants look best with which style of booties – what looks best with a wide cut jean? And what about skinny or cropped? I know you have a ton of questions but I hope that this post will address most of them. 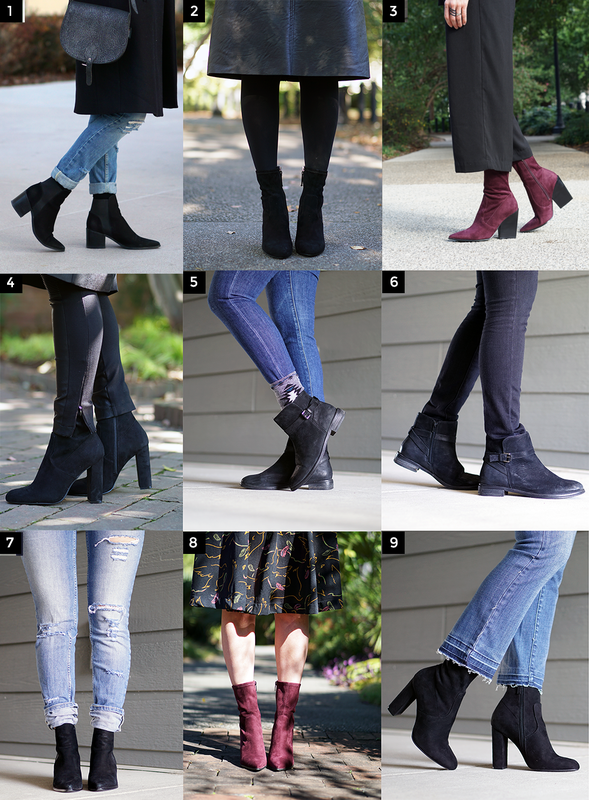 I’m talk about finding the best shape for you and your outfits, am sharing 12 different ways to wear ankle boots, and have picked my top ankle boots for 2018 to wear with dresses and skirts, cropped and wide leg jeans/pants, and skinny jeans. So, if you’re still searching for a pair of ankle boots to compliment your collection then this post is for you. If you’ve been searching high and low for the ideal ankle boot but still haven’t found a style that flatters you I’m going to bet that it’s got a whole lot to do with the height and width of the boot ankle. These two factors will make the difference between them looking terrible and looking fabulous. If you don’t believe me, check out how these five different styles look on me! The height of the boot makes quite the difference to how flattering they will be on you. Try a couple of different heights and notice which flatter you the most. In general, if the top of the boot cuts across a wide part of your leg then it will highlight that and make your leg look wider than it is. Just as the height matters, so too does the width (especially if you’re going to be wearing them with dresses and skirts). If you have slim ankles you might want to consider going for a narrow tighter style. If you have short legs, then a slimmer neater fit will be more flattering than a loose chunky style, and if you carry your weight on your bottom half you might find that a wider, chunkier style is more suitable. Consider the toe style. Pointy toes will elongate the leg, making it appear longer and narrower, while a square or round toe will shorten your leg. It’s no secret that a higher heel slims and lengthens the leg so if, for example, you have short legs you might want to choose a bootie with a heel. And for extra leg lengthening boost, pick a style with a heel and a pointy toe! And lastly, consider the shape of the heel. If you carry your weight on your bottom half, then kitten heels will be less flattering (they sometimes look a little squashed). And if you have slim legs then a chunky heel might be less flattering as it will highlight your slimness. You will probably find that you need a couple of different styles of boot; one to go with dresses and skirts and a second to wear with jeans and pants. I wear tight ankle boots with skirts, dresses and cropped pants and a wider, more casual, style with jeans, because that is what suits me the best. I recommend that you experiment a little and see what works best for you. If your ankle boots aren’t quite wide enough to tuck your jeans in (or for them to remain tucked in after you’ve walked a bit) then roll the hem of your jeans so they sit just above the top of the boot. For some pretty brilliant leg lengthening, match the color of your boots to the tights your wearing. Wear them with cropped pants. I prefer to wear a heeled boot with cropped pants as I find it more flattering but if you have long legs then a flat boot will look chic, too. Wear pants with a zipper at the ankle. If the ankle boot is wide enough and your pants narrow enough, simple tuck them in. If you want a more relaxed, ‘I just threw this on as I was running out of the house’ kind of look then try the half cuff. The trend for cropped frayed denim isn’t to everyone’s taste, but it is a great trend to pair with ankle boots. If paying for jeans that are already ripped and frayed just seem like madness to you, then you could always test it out by cropping and fraying an old pair of jeans. Wear them with a maxi. Wear them with a pair of tights in a contrasting color. At the end of the day it’s your own personal style that will play the biggest role in how you wear your booties, as well as how bothered you are about them flattering you. Just play around and experiment a little. There is a style for everyone and now is the perfect time to find yours! Pop on over to Pinterest and check out my board – How to wear ankle boots.